How to use Publisher Dashboard ? After you've activated your publisher subscription plan with SeattleClouds and went trough the set up process here: SET UP (click here) , you will get access to Publisher Dashboard. Use Publisher Dashboard to configure your publisher website and customize your white label website settings and configuration. In Account Setting Menu there are 11 Sub-Menus that you need to set up. b) Publisher ID - this is a unique ID used only in our system. Every Publisher has its own ID. Note that the Publisher ID cannot be changed. SeattleClouds brand name everywhere on your website and previewer apps. d) Build Host Name - you may provide a Host Name for the builds (Applications) folder address which is on our server. (ex: builds.<yourhostname>). If you configure a primary domain then create an A record on your register account and point it to the same IP address. f) Restricted IPs. Here you may limit the access on your website by setting IP addresses. The website will be available only for the IP addresses that you set. In order for the website to be available for everyone, leave this setting blank. With this setting you'll be able to change your website flow. Bellow you'll see the difference between Enabling/Disabling this option. By enabling this option all your website customers will be able to publish their apps FOR FREE. Bellow you can find your signup workflow if you'll enable this option. NOTE: that 'applications.html' file should be located in root directory of your website. 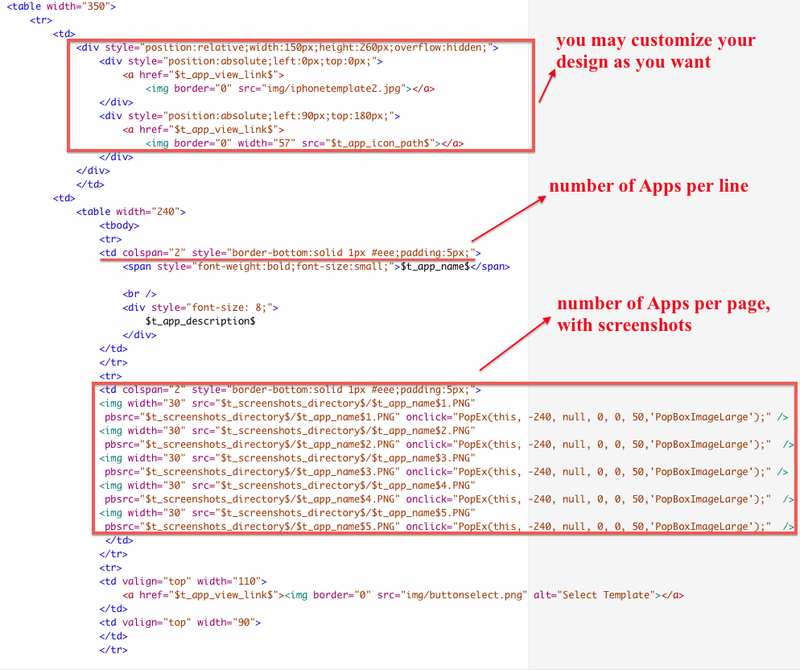 In this file should be defined the design of one template Application. Here is an example of an 'applications.html' design page. Note that all the images (e.g. screenshots) are from directory of the website in a specific folder. Now lets see how the page looks like. As you can see there are 2 Apps per row and 4 per page. Also the pagination is on the top. Feel free to change it as you want from the website settings. NOTE: These settings can be customized for each 4 devices (iPhone/iPod, iPad, Android, Kindle). If one of the link is empty it won't appear on the website pages. All the fields are customizable. Feel free to edit them anytime. The SMTP setting will be used by our system to send emails to your clients, send submitted form info within the apps created by your white labeled services. For example, if a client on your website created an app, adds a Feedback page type, specifies the target email and submits the app, the email will be delivered from the app to the target email using the above SMTP settings. a) You can add 3 language labels on your website (also you may choose which one would be the default). The localization tool allows editing any text string on your website. You may translate the website in any 3 languages. To edit a text string, click on the "Here" link (Click here to open the editor) . You may search directly by localizable key or by message. Once you have found the key (.aspx file) click edit to change the content of it. Also you have the option to remove the key. If you have more than one language version of your website , you may add/edit the text content here. Also, the Localization strings can be edited from tt.xml file which is located in the root directory of your website. You can login via FTP and open this file with any text editor. Please make sure to make backups before you edit this file. b) Since we frequently add new keys on the website you need to check time to time and update the new keys. You may search for the new keys (or missing), select them and update. The changes will take effect instantly on your White Label website. Set up all the metadata information for every .aspx page which appears on your White Label website. Metadata description - create an design your own Apps for iPhone, iPod, Android, KindleFire. Set up notification URL on the third party server which will receive notifications for a list of events on the white label website in JSON format. *A full working example can be provided by request in a support ticket. Authorize.Net Transaction Key - set up the transaction key that you have created in your Authorize.net account. It should be an alpha numeric key and looks like this: sd9sf93jk3429d0djl. If you don't have one, go to your Authorize.net account in the Security section of the page an click on the "Obtain transaction Key" link. Once you've created it, copy and paste in the Authorize.Net Transaction Key field. In order to use the Paypal Pro payment system you need to sign up for a Paypal Business account .Once you signed up for a Business account you will be able to get the Client ID and Secret ID on Paypal Developer website .In the Dashboard section you will find the test ID's and live ID's . You can use the test ID's for making fake transactions on the website. The live ones will be used for making real payment transactions. Select the currency related to your Paypal account. Grace Period - you can add a free period before the users will be billed. For example, if you set 30 days, then the user will be charged after 30 days he has subscribed using this payment system. You can set up the Account Number and Secret word on 2Checkout website in Account > Site Management . For more details on this matter, please check here . 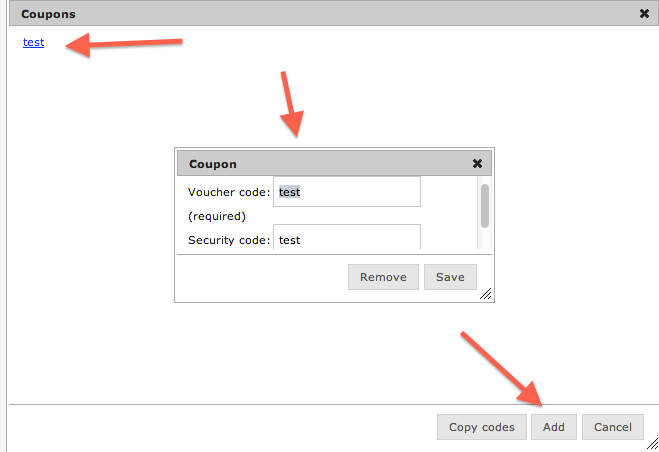 Coupon allows you to integrate a discount system on your website. 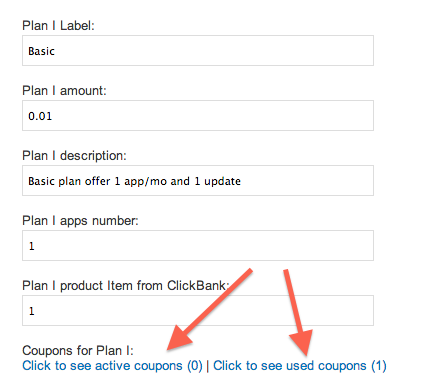 Set a Coupon Name, service URL and promotions months. Note that the first 2 fields will appear on the website on the payment page. Now you need to fill out all the Plans&Prices fields. Note that if at least one field is empty or has invalid value, no transaction will be available. 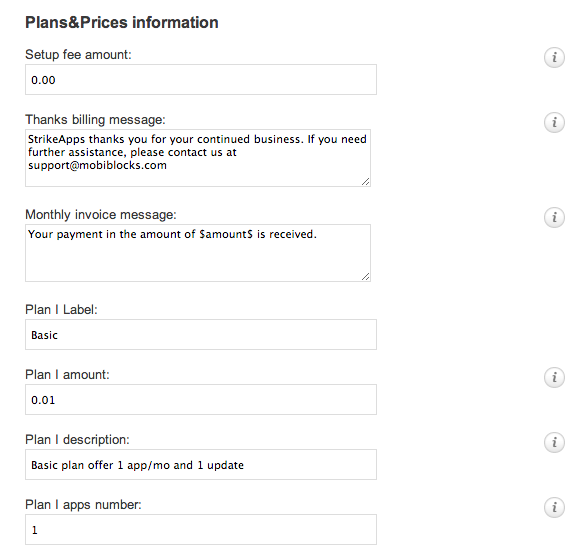 You can set any amount fees, messages or plan descriptions. After you are done with Plans&Prices fields, do not forget to click the "Save" button. If everything you have written is correct you will have the "ENABLED" message on the top. Use Application Manager to set the "Paid" or "Unpaid" status of all Applications made on your White Label website. a) You may search by User ID or App ID. 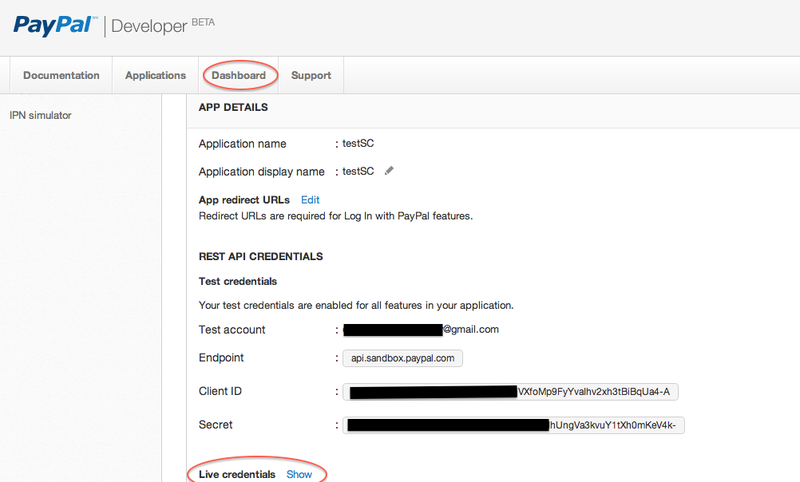 The User ID or App ID can be found in Application Dashboard. b) Build Info - you can see how many times and when an app was submitted for publishing. c) Paid Status - an app with this status will be activated. The user will be able to publish it without the need to have an active subscription plan. You can find here the FTP Access Settings for your website. By default "website" virtual directory is opened. You can use CD command or a Go To Folder menu item in your FTP client to change virtual directory to "myapps" and "myuserapps"
NOTE: Using your ftp credentials you can login via FTP and manage content of your publisher website. Here you can view default directory structure of the publisher website. toolboximages - this folder contains ToolBox icons which can be replaced with your own icons. views - this folder contains the header, footer files for your website. It also contains a few .aspx pages. emailtemplates - the folder contains all the email messages that your users are receiving. (e.g. for creating a plan, charging, canceling subscription, etc). You may open any file with a text editor and customize the text. NOTE: You can create new folders and files on your website folder, but do not use the following list of reserved folder names. Creating folders with these names will fail and any files in these folders will not be served. Below we can see a list of reserved folder names. *We recommend using FileZilla or Fetch as FTP client. Here you can manage all the users on your White Label website. a) Order a .txt file with all the users' email addresses. The .txt file will be sent on the email address registered on your main account on SeattleCloud's website. b) You can filter the users by active and non-active. An active user is one that has an active subscription plan. e) Create a fake subscription or view user's current plan. It looks exactly as a real subscription. The created plan can be editable. Feel free to edit the plan name, amount and next due date. f) Click on a user to login as him/her. As admin you have the option to login as any user on your White Label website. Once you logged in as a user, you will be able to edit his/her account. By default there are 2 templates on your white label website. Feel free to modify/delete/download them. You may also add new templates (unlimited number). a) You may set the templates availability based on the subscription plans. Basic, Plus, Premium, Business - filtering the templates by plans. b) Priority (Gravity) - the higher value (any number) you set, the higher place will have the template on your website. c) Edit the template, download it or disable/enable. d) Add a new template. You may upload any application created on SC or your White Label website. The template should be in .zip format. You may download any app as a template from Application Dashboard > backup. Here you can manage the page types on your website. You may enable/disable any page. Also set a tutorial link for any page. The URLs will appear once a page is added in the App from App Dashboard > Edit Pages. 9. Add your own Page Type. 1) Go to My Applications -> iPhonePreviewer's Dashboard -> AppStore Properties - Here you need to fill-in fields with your app infromation and resources. 2) Next step is to replace all "SAMPLE" resources that are not listed in AppStore Properties. Login to FTP (/website/ directory)using your SC Publisher account, find there devicehelpiphone.html and edit this file using any external HTML or Text redactor. Repeat these steps for each Previewer App. Should we make any other changes in the app settings such as FTP, SMTP, FB API key? Yes. The App settings are specific only for the Application. These fields need to be completed ONLY if you are using pages like Share, Feedback, Rate & Review or Form. Could you explain step-by-step how we should customize ABOUT tab? What should we do because it is not clear from the instruction..
You can find these files in the root directory of your website. Your FTP credentials can be found in Publisher Dashboard > Publisher FTP Access Settings. Once you login using FTP (e.g. FileZilla or Fetch) you will be able to open these files with any text editor. What is the Process to Change the publisher ID and Brand name? The Publisher Brand Name can be changed in step 1.1 Website Settings. The Publisher ID cannot be changed. This is extension ID for the username. The only possible way to have a new Publisher ID would be creating a new White Label Plan.